Building upon ongoing work at the intersection of architecture, health, medicine, textile design, fiber science, and biology, the Beacon features novel formal expressions that adapt to changes in a human-centered environment through formfitting and high-performance lightweight structures. Mathematically generated and activated by the hidden structures and dynamics of co-evolving datasets including human interaction via the Beacon app and turgidity data gathered from plants on the Rail Park, the Beacon is a 20 foot tall free-standing structure featuring knitted and woven lightweight, high-performing, formfitting and adaptive materials structured and held in tension with nonstandard stitched laser cut steel modules. 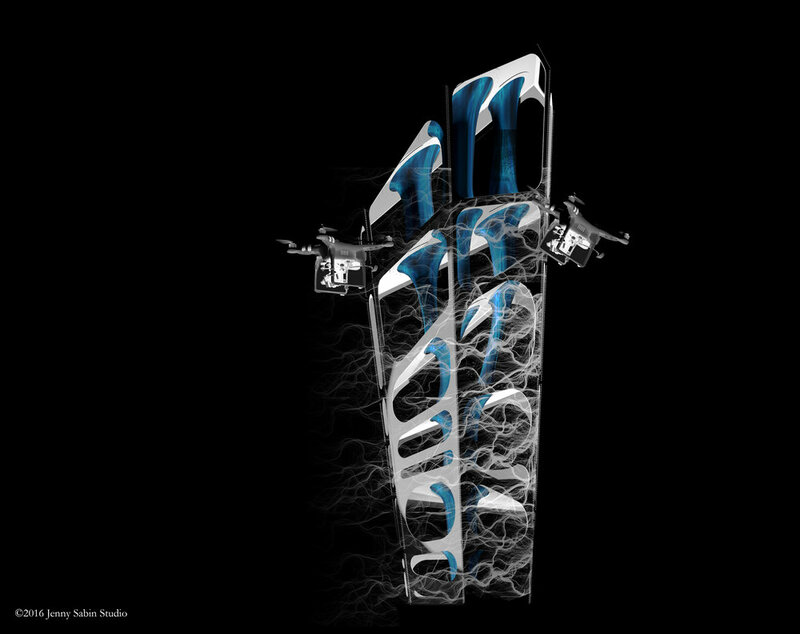 One of the first examples of large-scale material construction by drones in architecture, the exterior skin of the Beacon emerged over the course of 10 days, as drones wound and wove photoluminescent micro-cord in response to human engagement with the Beacon app. Material responses to sunlight, immersive color, as well as human physical participation are integral parts of our exploratory approach to this project. Responsive materials including solar active and photoluminescent yarns integrate cutting edge micro-scale manipulation of fiber features and effects to achieve human-scale changes in color in response to light, environment, and human activity. Forming a bridge between medicine and architecture through advancements in digital fabrication and emerging materials, this project promotes communication and active exchange across disciplines. 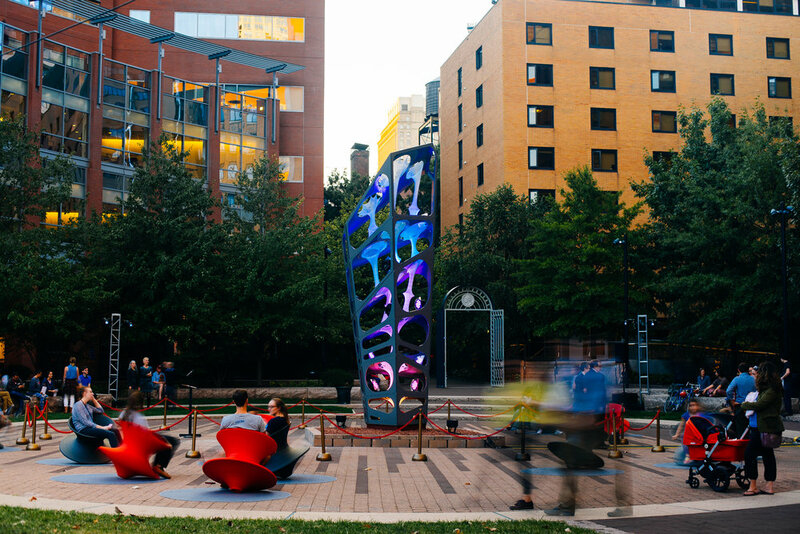 Through the integration of health, wellness, technology, and design, the Beacon generates spatial transformations of light that in turn, empower and inspire collective levity, engagement, and play in the city and beyond. Materials: primary modular structure of laser cut steel, interior fabric structure of knitted solar active and photoluminescent responsive yarns, water jet cut aluminum rings, exterior skin of photoluminescent micro-cord woven and wound by two X-Star drones with custom end effectors. Installation by Railroad Construction Company, Inc.